A: Because the potatoes have eyes and the corn has ears. I am the world’s worst at remembering jokes but I couldn’t resist! 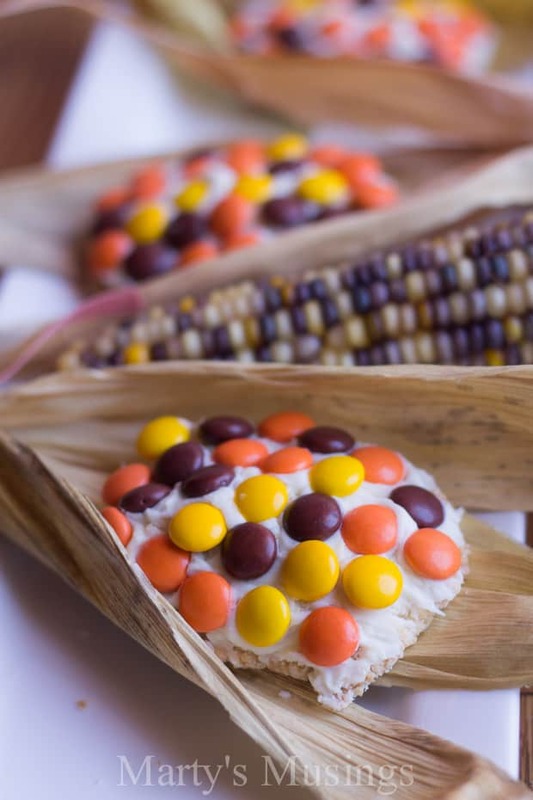 Sharing “corny” jokes was just too easy with these Indian Corn on the Cob Shortbread Cookies. Now you have some jokes to share with the kids at your Thanksgiving celebration, as well as this great cookie project to keep little ones busy while the meal is being prepared. I had never made shortbread cookies before so I was excited to stretch my wings a bit and try something new. Even though my youngest children are teenagers, I’m always looking for recipes that we can enjoy working on together. 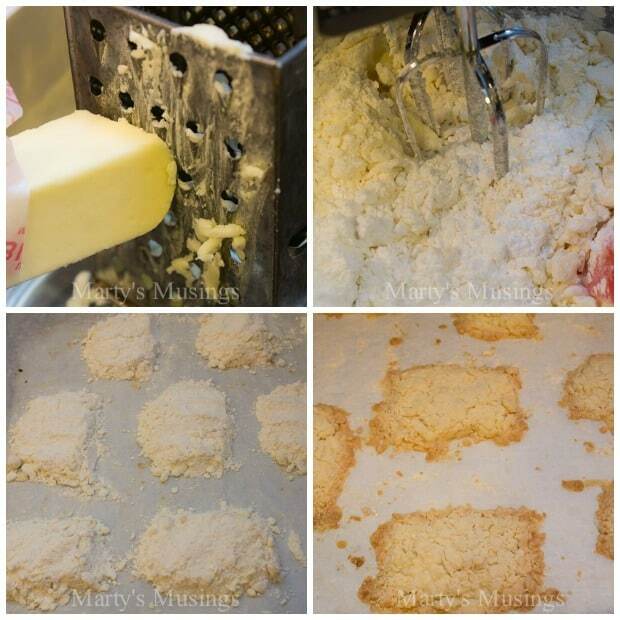 First I grated the chilled butter, then added it to my stand mixer with the powdered sugar, salt and flour. After that I added the egg and vanilla extract and mixed until just combined. Once I had gotten the dough to the refrigerator part (and for the second batch I actually put it in the freezer instead for a few minutes) I was unsure about the consistency of the dough. The directions called for placing a cookie sheet with ice cubes on it over the work surface where I would roll the cookies. I made two batches of dough so the first time I used the ice cubes and the second batch I just put the actual cutting board into the freezer for a few minutes to chill it. I think chilling the dough overnight is best but it still turned out too powdery for me to roll out. I just took the dough, mounded it in a rectangular shape and crossed my fingers. See that next picture? It worked! They may look fragile but these cookies held together perfectly. At this point I moved on to the fun part: icing! 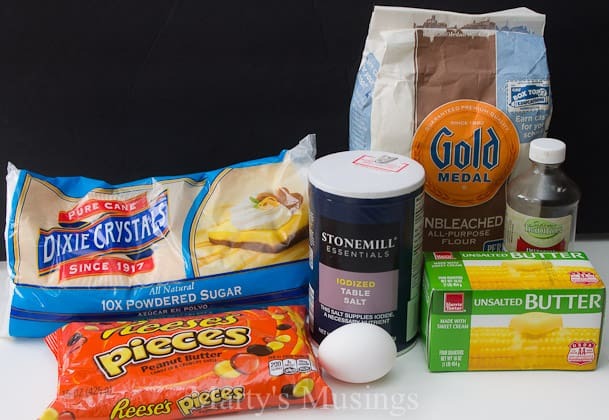 Dixie Crystals has a terrific recipe for royal icing that I’ve used before or if you need to take a shortcut you can use prepared icing. To assemble the cookies cut three pieces of raffia for the husks. Next time I would use craft raffia because it’s easier to manipulate than the real thing. I actually taped mine together to help with the presentation. 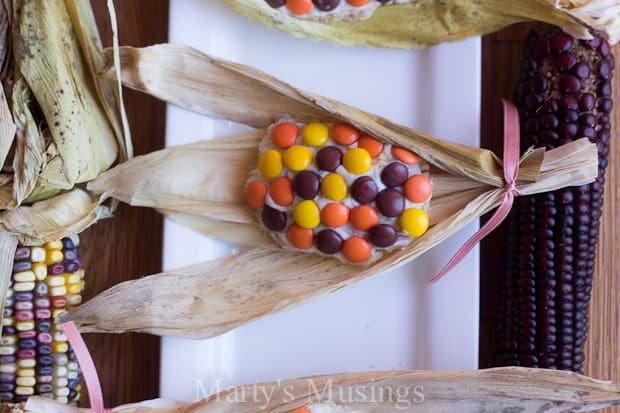 Insert the decorated cookie in the middle of the husks and tie the bottom together with a ribbon and you’re done! I was surprised that this chocolate lover would like these cookies as much as I did. Even by themselves without icing or Reece’s pieces they were delicious and my family gobbled them up. Get it? Gobbled them up? Okay. No more Thanksgiving jokes, I promise. You can see the shortbread cookie recipe via Dixie Crystals as well as more inspiration on their Thanksgiving page. 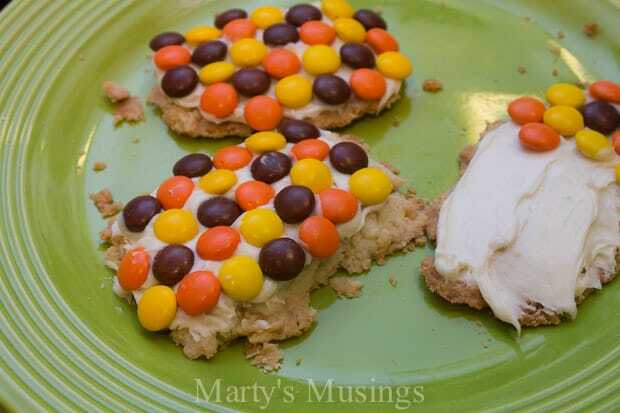 Beginning with a basic shortbread recipe, these cookies are topped with frosting and Reece's Pieces. Using a box grater, move cold butter sticks back and forth over the small "eyes" of the grater (same as you would to grate cheese). *Measure flour using the Spoon & Sweep method: Use a spoon to fill measuring cup with flour until required amount is obtained. Scooping measuring cup directly into flour bag will firmly pack flour resulting in too much flour required for recipe. Combine grated butter, powdered sugar, salt and flour in bowl of a stand mixer (using paddle attachment if possible or a hand held mixer with beaters). Mix on low speed until mixture resembles coarse meal. Add egg and vanilla extract and mix until just combined. Do not overmix. Place dough in refrigerator until firm enough to roll, about an hour or overnight. Meanwhile on the work surface area where you will be rolling dough, place a cookie sheet filled with ice cubes to chill this area. 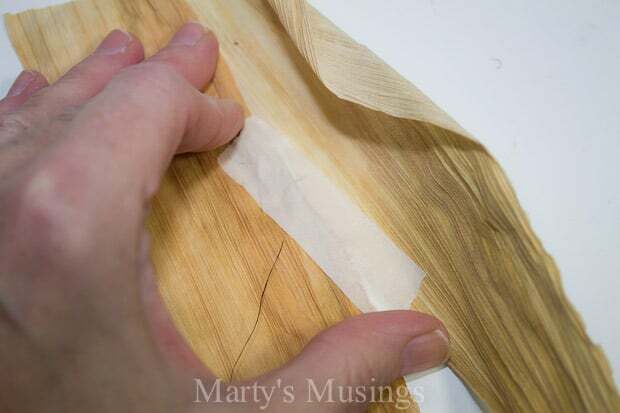 Roll dough to 1/4 inch thickness and shape into a corn cob shape (basically rectangular). Bake at 350 degrees until very light in color, about 16-18 minutes, depending on the thickness. Cool before covering the cookies with frosting and adding Reece's Pieces to the top. Cut three piece of raffia for the husks. 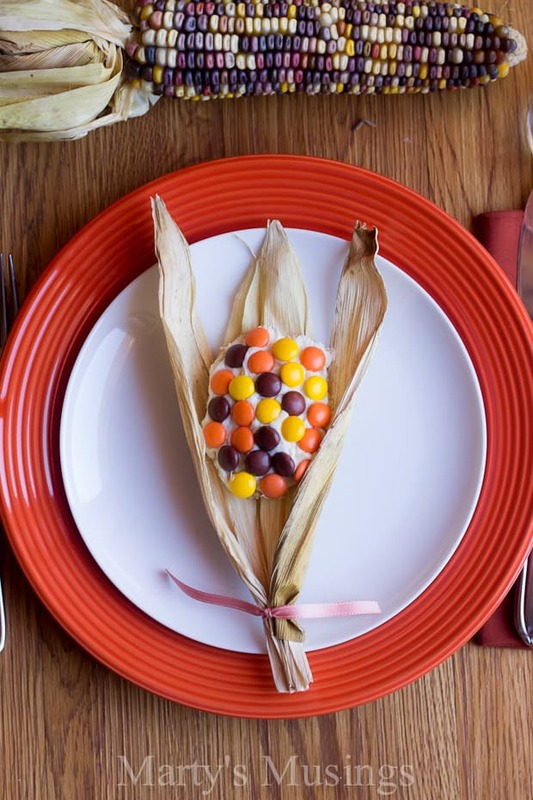 Place the cookie in the middle of the three husks and tie bottom together with a ribbon. My cookies were too powdery to roll out but they turned out beautifully even without it. Next time I would probably use craft raffia because it's easier to manipulate. I also just used whatever ribbon I had available to tie the raffia. 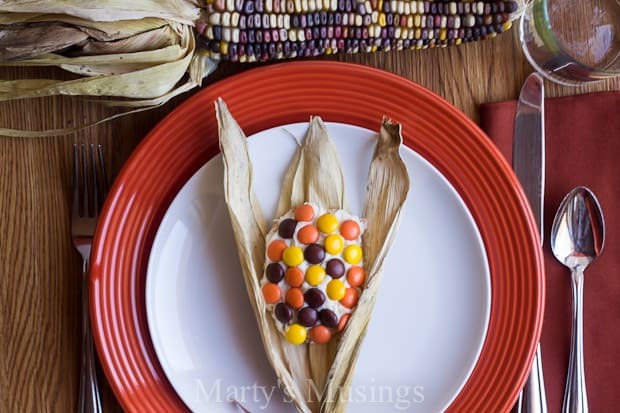 For more inspiration of all kinds check out Dixie Crystals Thanksgiving page: (recipes for all courses – appetizers, main dish, side dishes, desserts, candy, breakfast for company, etc., crafts for kids, edible crafts, FREE printables and activity sheets for the kids to do over the break). Disclosure: I was compensated for my time by Dixie Crystals but all opinions are my own. Looks fabulous on the plate even for grownups as a place marker, just add a little tag to that ribbon! thanks for sharing on craft schooling Sunday!